Political Social Work: Using Power to Create Social Change prepares social workers and social work students to impact political action and subsequent policy, with a detailed real-world framework for turning ideas into concrete goals and strategies for effecting change. Tracing the roots of social work in response to systemic social inequality, it relates the tenets of social work to the challenges and opportunities of modern social change. 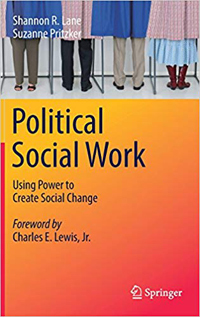 The book identifies the core domains of political social work, including engaging individuals and communities in voting, influencing policy agendas, and seeking and holding elected office.